Para obter o item Truta Arcana da A isca de Nat basta você ir em qualquer lago do Vale da Lua Negra. Não é necessário um node de pesca ativo no lago! Eu tinha 1.021 de perícia de pesca quando fiz e mesmo assim demoro para obter o item, então, não se preocupe. Chapéu de Nat obtido do Nat Pagle com reputação de Grande Amigo em Pandaria. Linha de Pesca Ancestral obtido através do drop do raro Resvalon, o Derradeiro. Quest does not seem to be showing up at 700 skill. Have a post on the bug forumns about it, will follow up once more info is known. Edit: Turns out I feel a bit silly, even though this is not stated on the Follower's page, you must also have Fishing Shack Level 3. 700 skill + 34 fishing rod, no bait. Took about 6 casts into pool to get one. 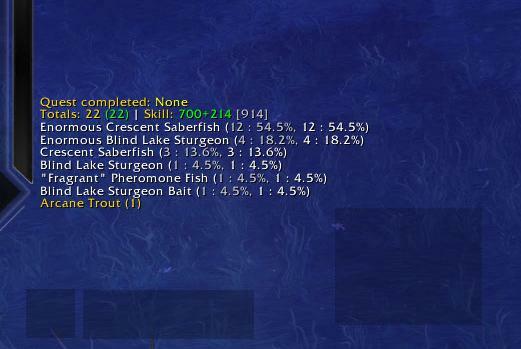 With 700 in skill, +100 from rod, +200 from Worm Supreme lure, and +10 from boots and helm it took me 27 casts. Do i need Fishing Shack LvL 3 to obtain the quest? The Truta Arcana for this quest is truly a magical fish: it turns into a Bagre de Lava on the next quest! To clear some confusion: Yes, you need to have a level 3 fishing shack. Yes, you need to have completed the Draenor Angler achievement as it grants the blueprint. No, you do not need to be best friends with Nat Pagle. No, you do not need to be fishing in a pool. 810 Fishing, first "water source" outside of garrison on alliance. Skill 975, took 9 casts at the large southwestern pool in Gloomshade Grove, just east of Lunarfall. 7 Casts right outside of Garrison - Fishing was at 1100 (Ephemeral Fishing Pole, Tentacled Hat and Worm Supreme). Had Tracking set to find fish - and "Arcane Trout" actually showed up on my minimap! Went there and caught on first cast! You do not have to fish in one of the explicitly marked areas on the map. My body of water of choice for fishing in Shadowmoon Valley is the lake right outside of Anguish Fortress, and it was not marked as one of the highlighted areas for this quest. I was still able to fish the Truta Arcana from it. It still has to be in Shadowmoon Valley, of course. 20 casts with 1000 fishing skill (ephemeral fishing pole + worm supreme + 700 skill) in burial fields. I think skill doesn't improve how many cast you need, you just need more than 700 skill. Skill level 944 (including a Worm Supreme), went straight to the water NE of Embaari Village (where a warm welcome awaits you!) and got the Arcane Trout on my sixth cast. I think this quest broke for me, on my alliance character. The quest showed up before my character had 700 fishing. I went to Krasarang, turned it in, but did not get a follow up quest. A week later, I finished raising my fishing to 700 (all the while there was a Nat Pagle vendor NPC at my level 3 fishing shack), and there was no quest to get Nat as a follower. I went back to Krasarang and sure enough, Nat has a ! over his head. TL;DR -- do not waste your time going to Krasarang until you have 700 fishing, or you will not be able to get Nat as a follower. 9th cast with 909 skill for me. Fished in Gloomshade just outside Alliance Garrison. Fished in open waters, not in a pool. level 700 fishing + 30 pole... 8 casts at Moonwillow Peak. Amazingly enough, my hunter fish-finding dots even showed up on my mini-map to let me know which side of the pond to fish! 935 fishing skill, took me 27 cast to catch it at Moonwillow Peak. If I do this, will Segumi finally SHUT UP about him? 21 casts with 845 fishing skill. Used Arcanite Fishing Pole, Fishing hat, and Sharpened Fish Hook. You don't have to have super-enhanced fishing. I fished the trout up on the 4th cast with 725 fishing. Btw, you do *not* need to have 700+ fishing to catch the quest fish - I caught it at 622 skill (didn't have a pole or any fishing buffs) on my 10th cast (not fishing in pools, fwiw). Just caught it on my 9th catch with no baits, with only a Big Iron Fishing Pole (no added enhancers) in Moonwillow Peak standing at (37.31, 51.66). 10 casts for me, from the little pool at 36,26 just SE of garrison. 700 fishing with worm supreme and the dragon pole. Once I turned it in though, it changed to the horde's molten catfish for the 2nd part (finding nat Pagle) but then Nat still took it as the trout. 6 casts with non of this extra 10+ rubbish just go the the areas highlighted and fish..
Just fished up Arcane Trout, with 8 casts in Secluded Glade near the Garrison. Only equipped with <Jeweled Fishing Pole> & <Sharpened Fishing Hook> , Skill level 700. And not even any bait! It is truly not a difficult quest to complete. Happy Angling! Having just went through a couple of days of binge fishing in an attempt to get Pescador de Draenor, the thought of seeking out another 'impossible fish' filled me with dread. But this really wasn't as bad as I'd thought it was going to be. Make sure you have a few fishing buffs, but you don't need to go overboard. I fished behind the rare Veloss at approximately 22, 20 - with only a single pathing level 91, it's easy to avoid any unnecessary aggro. FYI: Along with a level 3 fishing shack, your fishing skill MUST be at least 700+ in order for the quest to be offered! Using lures to raise skill does work! Just caught the mighty Truta Arcana after 16 casts, with just the basic 700 fishing skill, no buff or shiny fishing pole ! Happy Fishing! Note that this page is for the Alliance's A isca de Nat in Frostfire Ridge. Horde's A isca de Nat is in Shadowmoon Valley. Any water in those zones work, except in the garrison. Just FYI... you do NOT have to have 700 fishing skill to get the quest. I have 577 fishing skill. I put on a tentacled hat and a worm surpreme on my rod (which brought my fishing skill temporarily over 700) and lo and behold, I saw a ! appear behind me and this quest was offered. I'm off to see if it can be completed at this same skill. Yes, I do have a level 3 fishing shack. Yes, I do have a character on another server with 700 fishing. Edited: Turned in the fishing quest i was on, which brought my fishing to 592, and caught the arcane trout in 8 casts. You DO NOT have to be 700+ fishing skill, mine was just below. the quest popped up for me as soon as I upgraded my shack to three though. Also, you can fish these in any body of water, you do not need to fish the trout from a pool. I got mine in 5 casts in the first little pond I saw. ☼ Level 3 Fishing Shack, this means you need to have the Draenor Angler achievement in order to do this quest. Fishing shack level 3 - fishing level 700 - fishing in The Nightmarsh and using just Bone Fishing Pole and Blind Lake Surgeon Bait it took me 17 casts. Finally got off my duff and started working to get Nat Pagle as a follower and wish I'd done so much sooner. For this quest i fished up the item in 12 casts in a small pond in Gloomshade Grove at 37.88 23.91 with an overall fishing skill of 810. Got the trout at 44, 50 in nine casts. I can confirm I caught an arcane fish in 12 tries not in a school pool. At Coords 23.49, 20.75. Pegue uma Truta Arcana no Vale da Lua Negra e leve-a para Segumi. Agora que você já conhece bem os peixes de Draenor, talvez consigamos convencer Nat Pagle a vir para cá também. Se realmente quisermos que ele faça o esforço de vir até aqui, teremos que provar a ele que existem peixes incríveis em Draenor. Vá às águas do Vale da Lua Negra e veja o que pode fazer. O tempo que você gastou lapidando as suas habilidades vai valer a pena agora. Pegou alguma coisa que presta?